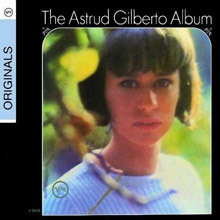 From Bahia, north eastern Brazil, one of three sisters born to a German father and a Brazilian mother, Astrud was born in 1940; Gilberto's family moved to Rio de Janeiro when she was only 2 years old. Before going to New York in 1963 with her husband, João, the twenty three year old Astrud had never sung professionally, but in a recording session with Stan Getz, everything was to change. Verve was keen to build on Getz's success with bossa nova and so teamed him with the best Brazil could offer – Antonio Carlos Jobim and João Gilberto. 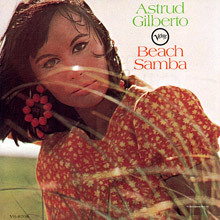 Producer Creed Taylor needed some of the vocals on 'Getz/Gilberto' to appeal to the American market, and Astrud was the only Brazilian who could speak enough English. After João recorded the first verse of 'The Girl From Ipanema' in Brazilian, he had co-written the song with Jobim, Astrud delivered her breathy second verse in English. It is a song that everyone knows and one made all the more perfect by her untrained, faltering, delicate vocal. 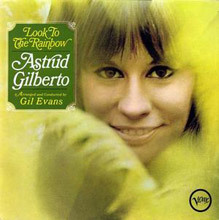 She worked with arranger Gil Evans on 'Look to the Rainbow' (1966), her fellow countryman, the arranger and organist Walter Wanderley on A Certain Smile, a Certain Sadness (1966), and arranger Albert Gorgoni on I Haven't Got Anything Better To Do (1968). Gilberto gradually went out of favour in America, but remained a huge star in Brazil for a decade or so, until her easy-going style, was eclipsed by the higher-octane jazz-fusion and Brazilian pop of a new-breed of stars including Flora Purim, Elis Regina and Gal Costa. 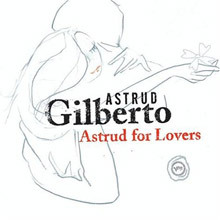 Astrud for Lovers is a strong collection of love songs performed by Brazilian singer Astrud Gilberto. Her wispy and melancholic vocals are featured in a variety of settings recorded between 1963 and 1969 for Verve. The earliest tune, "Corcovado (Quiet Nights of Quiet Stars)," is taken from the legendary Getz/Gilberto album that marked Astrud's star-making first recording. The rest of the collection finds her with Stan Getz again doing a sweet version of "It Might as Well Be Spring" in 1964, crooning a smooth "Tu Mi Delirio" with organist Walter Wanderley in 1966, fronting a big orchestra in 1969 on two songs taken from the Beach Samba album, and essaying the intimate "Mahna de Carnival" with just guitar for accompaniment. The album shows that while she had a limited vocal range she knew how to get the most out of it and that she was equally at home in many settings. Not to mention that the collection establishes and maintains a lovely romantic mood throughout! That is what they had in mind no doubt and they succeeded. 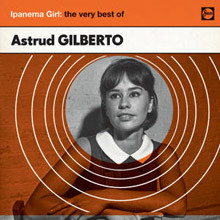 Astrud Gilberto became an accidental success when her fragile command of English made her the de facto choice to sing "The Girl from Ipanema" at a session led by Stan Getz and her husband, João Gilberto. Of course, despite its overwhelming success, it wasn't clear that she could sustain a career when she recorded her first solo LP, The Astrud Gilberto Album. She had sounded more like an amateurish novelty act than a recording professional, her voice was sweet but fragile, and the Getz/Gilberto album had featured two strong voices, with Gilberto herself an afterthought (albeit a commercially effective afterthought). But The Astrud Gilberto Album was at least as good as Getz/Gilberto (despite what jazz fans say), for several reasons. The Brazilian repertoire plays particularly well to traditionally weak vocalists, her voice was yet more sweet than had been heard previously, and as before, the record featured two strong leaders -- arranger Marty Paich and the incomparable Antonio Carlos Jobim. Paich's strings positively coated the album with radiance, and his choices for lead instrumental voices -- Bud Shank's flute, João Donato's piano, Jobim's guitar -- complemented her vocals perfectly. Gilberto sounded beautiful on a range of material, from the sentimental "Dindi" to the playful "Agua de Beber," and as long as intelligent musicians were playing to her strengths (as they do here), the results were splendid. Like Nico, Astrud Gilberto's everywoman voiced has always had a polarizing effect on critics and fans alike. While her take on bossa nova is less than reverent and decidedly lightweight, the warmth and approachability she brings to each performance is stunning. Verve's lovingly compiled -- and blissfully affordable -- Astrud Gilberto's Finest Hour is as solid a collection of her heady mixture of samba, jazz and pop as you're likely to find. Twenty songs, including the classic "Girl From Ipanema," wash in like waves from the warmest of oceans, carrying with them the soft, reverb-drenched soundtrack to summer. If the tropical heat of "Berimbau," the lazy and lonely pulse of Burt Bacharach's "Trains and Boats and Planes" and the upbeat swing of "Wish Me a Rainbow" don't instantly take the drudgery of your day away, then consider yourself hopelessly bitter. Highly recommended. 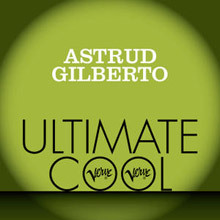 Compilation from 2013 spanning the very best of Astrud Gilberto's cataloge on the Verve label. The CD reissue includes five bonus cuts from A Certain Smile a Certain Sadness, recorded in 1966 in more authentically bossa nova-style arrangements, anchored by organist Walter Wanderley. Excellent 28 track collection featuring all of Astrud Gilberto's most loved recordings. 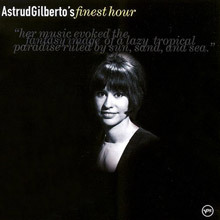 This was a beautiful bossa nova record of Astrud Gilberto's vocal stylings...All the material (32:13) here, with the exception of "Learn to Live Alone" and "Pretty Place," which were arranged by Al Cohn, were arranged by Gil Evans. With the exception of a Johnny Coles trumpet solo, the personnel was uncredited on this 1966 recording. Discographies have credited Bob Brookmeyer (valve trombone), Kenny Burrell (guitar), and Grady Tate (drums), but except for a few bars of sax, there was no solo indivdualism in this large Creed Taylor-produced orchestra. 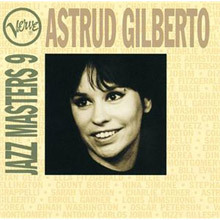 Astrud Gilberto's entry in the nicely appointed Verve Jazz Masters compilation series shows exactly why the Brazilian singer is deserving of such an accolade. In her '60s heyday, Gilberto was often derided by jazz purists for her vibrato-less "desafinado" (deliberately slightly off-pitch) singing style and deadpan, childlike voice. But the diminutive bossa nova star has since been a huge influence on dozens of jazz and pop singers. VERVE JAZZ MASTERS is less of a greatest hits package than it is a smartly balanced retrospective of many of Gilberto's best performances. Her biggest hits, "Call Me" and "Summer Samba," are not included, and her signature tune, "The Girl From Ipanema," is only represented by a live take from a 1964 Carnegie Hall concert. The collection places equal emphasis on Gilberto's bossa nova-style interpretations of jazz standards and on her signature Portuguese-language sambas. The smartly packaged CD also features remastered sound and several rare photographs.